Having trouble Christmas shopping for the Fly Fisher in your life? Fret not! Hank's got you covered. Merry Christmas everyone! Snap It! Winter fly fishing can a be a very rewarding time to get out on the water. 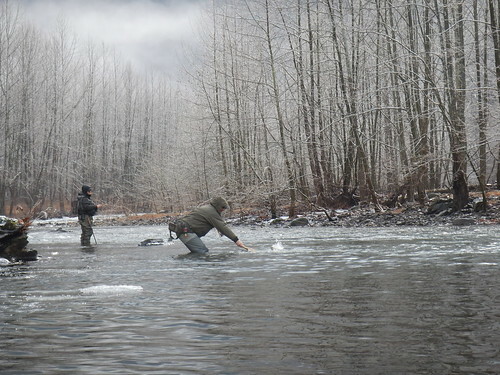 The most important thing to an enjoyable day of winter fly fishing is dressing for the weather. After decades of winter activities like hiking, hunting and fishing you would think I would know better, but one of my worst days fly fishing was because I forgot my wool socks. Not so smart with my cotton socks. So let's take a look at the best approach wintering up for a day of fly fishing. You've heard it before, but I'll say it again. Layers, layers, and more layers. The most important thing are the correct layers. Alright Captain Obvious we know cotton socks don't work, so the best bet is a two layer approach with your feet. I first put on a thin polyester wicking sock. Overtop of the polyester sock I use a classic ragg merino wool sock. Bigger can be better, but make sure you can still get into your boots comfortably. If your socks are too thick and your feet are too tight in the boot this will not help keep you warm. What you are trying to accomplish is wicking away the perspiration from your feet with the polyester sock to the wool sock. Again layers are the way to go. Keeping your legs and lower body warm while in the water is a non- negotiable. A few years ago I ended up getting a pair of Simms Guide Mid Pants. These pants are made of fleece and provide greater insulation than cotton. I would imagine you can get a decent pair of tapered fleece pants online that will do the trick. I like the tapered pants as they bunch up less at your ankles when you get into your boots. Often I'll wear a pair of light polyester long pants overtop of the fleece pants. A few ways to approach this but I'd avoid the cotton sweat pants. I generally have a three layer approach to the upper body. I use synthetic polyester base layer for wicking. I like the Under Armour mock longsleves. Offers a good base from the arms to the neck. The middle layers are your main insulators and going to keep you warm. A couple layers of fleece or wool always work for me. I found a great fleece shirt at Walmart for $10 a couple of years ago and is my goto whenever I head outside. A good down vest can work too, but you don't want too much bulk. The number of layers and type is really up to you and the temperatures you expect to encounter. Finally for your upper body is a good outer shell. The key is something that will keep the wind from getting to you. With the layers you have already put on, a big winter coat is not best step here. A winter windstopper shell that is water repentant is the answer. This is the place I would invest my money. I have an older Simms windstopper jacket that works great and think I spent $200 at the time. With layering this jacket works from October thru April for me. Today I would look at the Simms Bulkley Jacket ($349) or Cabela's Guidewear WindStopper Jacket (on sale for $110, but not water repentant). Specific fly fishing wading jackets are usually cut short in length and make it easier fitting into your waders. Once you are dressed and have your waders on you want warmth, but also upper body mobility too. Fingerless gloves or mittens are a must. Plenty of good options made of wool, fleece and polyester. Leave the ski gloves for the slopes. Last but not least is a wool hat. You really should try all this gear on before you go to the stream. Adding a few more layers may cause some difficulties getting onto your fly fishing boots and waders. The holidays don't help either. No sense having all the right gear if you can't fit into your waders. I enjoy my fly fishing backpack this time of year with layers I am taking off or adding on. Finally, even if you don't think you'll need it, bring an extra layer to leave in the car. 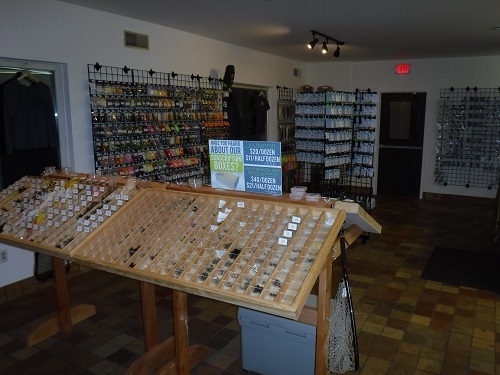 There is a new fly shop open in Mount Holly Springs Pennsylvania and the founder and owner is my friend and Trout Unlimited colleague, the estimable Justin Pittman. Justin needs no introduction to Cumberland Valley regulars, but I’d like to introduce him and give you a chance to hear some of Justin’s thoughts on fly fishing and his new business. Dave Weaver: How did you get started in fly fishing? Justin Pittman: I got started in fly fishing early in college. I went to college at Lock Haven University and was always into fishing. I wanted to take my fishing interest to a higher level and bought my first fly fishing outfit from Phil Baldochino at Kettle Creek Fly Shop. DW: Is there an area of fly fishing that you most enjoy – throwing streamers, fly tying, bass, match the hatch, etc.? JP: Probably the area of the sport that most appeals to me is wet fly fishing. I’m a serious night fishermen and love to be out after dark from Memorial Day to Labor Day and this is probably the most exciting time of the year for me. I’ll throw dries or nymphs, and streamers when it’s bitter cold, but I just really love to wet fly fish. DW: I admire your conservation efforts recently in the Cumberland Valley. You’re a busy man with many irons in the fire. 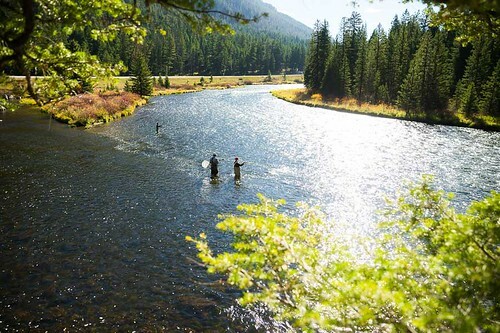 How do you find time to fly fish or enjoy the outdoors? JP: I do value conservation, and you’re correct, I’m very busy. I’m a probation officer for juveniles as my “day job” and I own Holly Flies along with Precision Fly Fishing and Tackle now. I get out fishing when I can as I have a seven and a nine-year-old. My wife and I live locally and, while I can’t get out fishing as much as I used to, I try to stay involved in the community and enjoy the sport when I can. For me, perhaps the most rewarding side of the teaching and conservation angle is the Cumberland County Street to Streams Program, an organization I created to introduce youth, many of them with drug and lifestyle problems, to the sport of fly fishing. We’re starting our tenth year now. We partner in this effort with the Cumberland Valley Chapter of Trout Unlimited and I think the program has been a great success. It’s one of my proudest accomplishments. 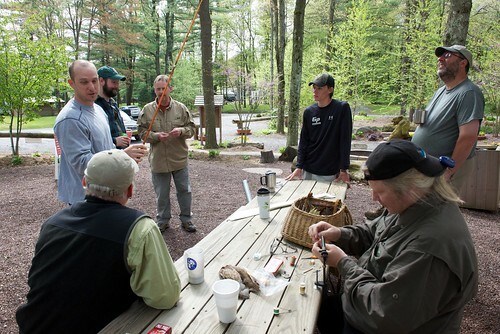 DW: Do you have a fly fishing or outdoor mentor and, if so, how did they influence you? JP: I wouldn’t say I had as much of a fly fishing mentor, as I had an outdoors mentor. I grew up in a strong outdoors family in Newburg Pennsylvania and my father and grandfather were huge outdoorsmen. Hunting is bigger in my family. We did a fair amount of fishing but, as I said, I really didn’t get into fly fishing until later in my life. My father was the initial outdoor mentor in my life. Over the years, I’ve had the fortune of many experienced and wonderful people who have taken me under their wing and helped me grow. DW: Why did you decide to start Precision Fly Fishing? JP: Precision Fly Fishing developed in my mind initially as a means to grow my fly business. The trend in this business is moving toward wholesalers selling directly to retail markets online. I received some encouragement from some prominent fly fishers here in the Cumberland Valley to open a fly shop. After talking it over with my wife and further discussing it with the local experts, we came to believe that a local fly shop could be successful in this area if done the right way. DW: Does Precision Fly Fishing carry merchandise outside the realm of fly fishing, and if so, what are they? JP: Although we’re mainly a fly fishing business, we do carry merchandise outside the realm of fly fishing. We felt that, considering the outdoor market in this area, that we should offer a live bait and spin tackle section, if this was feasible. 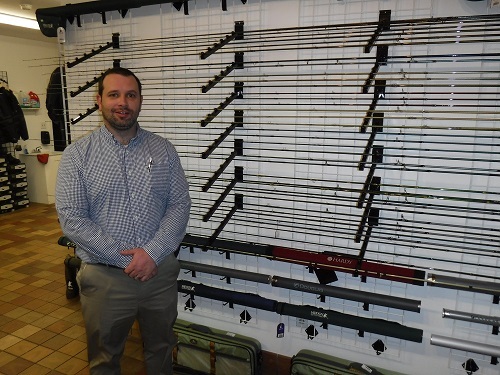 Initially, we had a limited range of conventional gear, but the demand in this are was higher than we recognized, so we’ve expanded our fly fishing and conventional gear area out to about four thousand square feet of display area. We hope to address all the needs of local anglers. DW: What makes Precision Fly Fishing a unique business relative to so many other fly fishing businesses? JP: Well, every fly shop is a unique business and Pennsylvania has had a lot of great local fly shops that have become important cultural aspects of a local region or watershed. Many of these shops are friends of ours and they have helped me personally to start and grow this business. We do run a guiding program. Particularly unique to our business is the fact we have a fifteen hundred square foot apartment on the second floor above the shop – the “Angler’s Nest” - which we rent to visiting outdoorsmen. This is something we hope to continue and expand in the future. 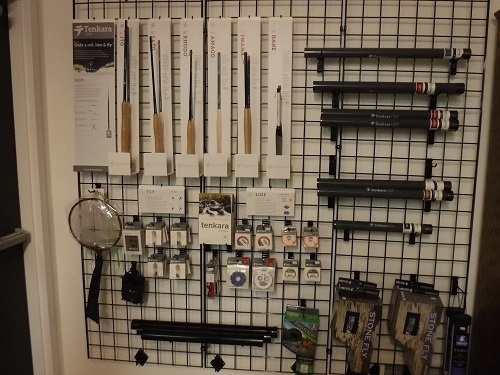 Our business is also unique in that the store layout displays the fly fishing and conventional gear in separate wings. Spin anglers can visit that section and, hopefully, eventually expand into fly fishing and visit the other side of the house. Also unique to Precision Fly Fishing is that we carry one of the largest selections of flies available on the East Coast. We currently have out on our show room floor about two thousand patterns and this is being expanded to closer to three thousand patterns between now and spring time. DW: What is your business philosophy behind Precision Fly Fishing? DW: What has surprised you about the fly fishing business since you got involved? JP: Well, I’ll tell yuh, one of the things that really surprised me is the amount of fly tying material that is available out there. We could fill this building many times over with the amount of tying material that is on the market. We’ve long sought out materials from around the world for Holly Flies, but it is just really amazing how much of this stuff there really is out there. This was a real eye opener for me as I entered this business. DW: Where is Precision Fly Fishing located and how can customers get in touch with you? JP: We’re at 502 North Baltimore Ave., Mount Holly Springs PA 17065. We can be reached at our website: www.precisionflyfishing.com and www.precisonflyfishingandtackle.com. Phone number is 717 486 4646 and you can follow us on Instagram and Facebook. 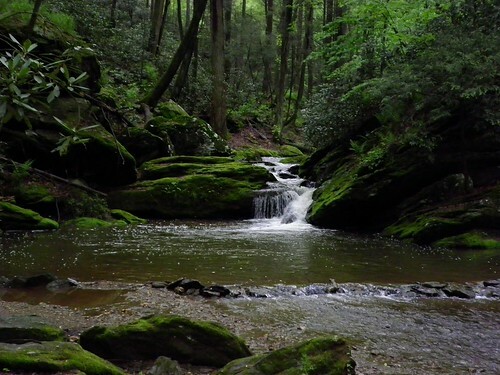 We’re very close to some of the best trout fishing in central Pennsylvania with Mountain Creek right behind the shop, Yellow Breeches about a mile up the road, and Letort just a few minutes further. 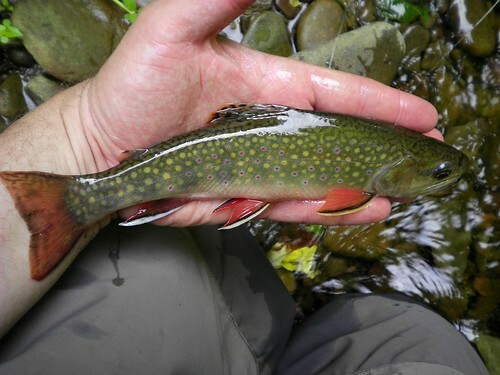 The Susquehanna is less than an hour away, and there are mountain brookie streams within minutes of our shop. DW: What are some of the major brands you carry? DW: Where do you hope to take Precision Fly Fishing in the future? JP: At this point in time, we just hope to see continued positive growth within the fly shop. We hope to be a valued pillar of the local community where people can drop by, get a cup of coffee, and enjoy their experience. We hope to continue to grow, thrive, and serve the fly fishing community. So tell us about the Open Air Project? Steve Sunderland and I decided one day to start a podcast about hunting, fishing, and the outdoors. The vision for The Open Air project was to share with people the stories of us and our guests, all while educating everyone in the process. We both feel that learning is a never ending journey, one that we intend to share with our audience. If we can learn, meet unique people, and make few friends along the way, we feel that we've accomplished our goals. Our audience is anyone that enjoys the outdoors and nature. We'll cover topics that vary from hunting, fishing, hiking, backpacking, camping, canoeing, and really anything in between. You may tune in one day and hear about a topic that you're deeply involved with and have a true passion for learning about the intricacies of. The next episode may be something that you've always had an interest in but maybe not had the time to learn about or even experience. We also do a small segment about craft beer at the end of every show, and have had some good feedback about that. What got you interested in starting the Open Air Project? I love listening to podcasts, and thought it'd be cool to give it a shot. It's also a great opportunity to get together with some cool people, hear some stories, and drink a couple beers. What has been the biggest surprise for you in taking on this effort? The biggest surprise has to be how intricate the process was to setup. I thought we would just record some stuff, submit it to iTunes, and that would be that. That was hardly the case. I had to learn a lot about building a website, RSS feeds, producing good sound quality, hosting media files, and much more. I enjoy a challenge, so in the end it ended up being a good surprise. 2018 is going to be a great year for The Open Air Project. We have some great guests lined up already for the upcoming year, and we'll also be producing some video gear reviews. One of our other goals for the year is to record as much footage as we can of all of our adventures. We have a fishing trip to Montana planned, and a hunting trip to Ohio that we hope to produce video content from. What are your biggest outdoor interests? My current outdoor interests include fly-fishing, hunting, camping, canoeing, hiking, and just being in the woods. In my lifetime my hobbies have varied depending on the area I've lived in but have always involved the outdoors. Some of those include, snowboarding, surfing, and whitewater canoeing. Where are your places on your bucket list? Man, that's a great question. I've been fortunate to be able to cross off a ton of my traveling bucket list places in the last few years, but just like anyone else I have ton more places that I'd like to go and see. I'll just list the ones that would have to do with hunting and fishing for the purposes of this article. Tops on my list would probably include New Zealand, Alaska, Colorado, and British Columbia. How did you get started into fly fishing? I started fly-fishing relatively late in life. I have a good friend that invited me on an annual trip to Pine Creek, and everyone there fly fished so I borrowed a rod every year and went with them. After about three years of doing this I decided to give it a real try. Well, when I get into something I don't typically just dip my toes in. I try to learn as much as I can as fast as I can. I have a competitive side to me, and I don't necessarily mean with other people, but with myself. I want to be good at whatever I do. That's just my personality and I'll typically push myself pretty hard to be better. With fly-fishing, I feel there are three main ways to do that. First is to do research, and that's how I found Paflyfish, and I feel that it's the best place on the internet to learn about fly-fishing. Second, is by learning from others. A mentor can really cut the learning curve. Paflyfish helped me there also, because I was able to meet some great people that were willing to share everything that they knew. This also led me to some great friends that I shared some amazing moments with. Last and what I feel is the most important is time on the water. It's really that simple. You can talk about fishing all you want but to really understand it you need to be there, and do it as much as you possibly can. What are your favorite areas of Pennsylvania to hunt and fish? My favorite places to hunt in PA are right where I live here in the Clearfield area. I can be on some of the best public hunting land in the state within 10 miles, and there's more land than someone could hunt in a lifetime. Our game commission doesn't get the credit they deserve for not only providing us with great places to hunt, but also (although some would disagree) they've made what I believe are some great decisions within the last 20 years to improve the overall health of our forests. As for fishing, it would have to be the central part of the state. Again, I'm blessed here also, as I can be on the Little J or Spring Creek within 30-40 minutes. this has allowed me to get to to know these streams intimately, and if you combine those with Penns Creek, and Big Fishing Creek, I'm not sure there's a better area for fishing on the east coast, especially come May. Where can people find you and the podcast? You can find me on Paflyfish I check in there almost daily, and am more than willing to answer any PM's, but you can find the podcast in the links below. I think one of the coolest things is that if you own an Amazon Echo (Alexa) you can tell her to "play the latest episode of The Open Air Project on Tunein Radio" and it starts to play. 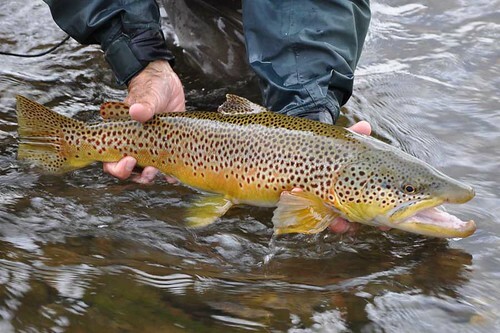 For myself and many other local anglers, Montana’s fall run of Brown Trout is the most anticipated event of the year. Large, lake dwelling trout begin moving into the river systems during late September and October and are accessible to fly anglers during this pre-spawn period. Productive fishing will last as long as the weather (or in some cases, regulations) allows, usually sometime in mid-November. This is far and away my favorite time to guide and fish in Montana, and having a shot at these big lake run bruisers is the main reason why. While there are a myriad of places to catch a big fall Brown Trout in Montana, the Madison River ranks at or near the top of the list. With 3 lakes along its course, Hebgen, Quake, and Ennis, the Madison offers 3 different runs within a close distance of each other, significantly more variety than you will find elsewhere. The Madison has options to both float and wade, as well as to fish streamers or nymphs. 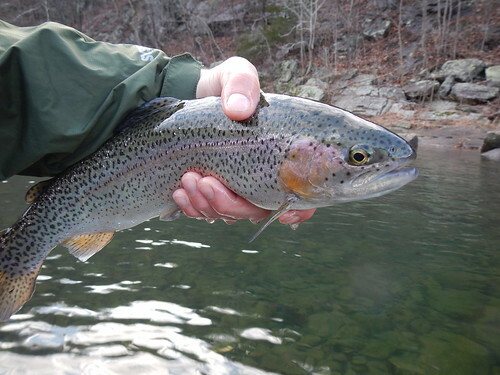 Additionally, the Madison has a fall run of Rainbow Trout as well, giving the angler more shots at large trout. While some general rules and guidelines apply, each run of fish on the Madison is different, and learning and applying these nuances is what makes this type of fishing some much fun. No matter which section of the Madison you choose to fish, the techniques will be similar. Fishing for these migratory trout is a nymph and streamer game, as they are not inclined to feed on the surface. You will want to beef up your tackle for this kind of fishing. When fishing from a boat, I prefer a 9ft 6wt or 7wt rod, and employ a sink tip when fishing streamers. When wade fishing, I have converted to using a two handed switch rod in an 11’4” 7wt. Long popular with steelhead fisherman, these 2 handed rods are quickly catching on with trout anglers. The longer rod allows for easy roll casting and mending, as well as the ability to use longer leaders and more weight. You can also employ various sink tips to swing streamers or wet flies, which is a very popular technique for Steelhead in the Pacific Northwest. While a two handed rod is by no means a necessity for fishing the Madison, it is a fast growing segment of the fly fishing market and one that I have found very useful. A 6wt rod between 9 and 10 feet will work just fine for wade fishing. For flies, it is hard to beat a stonefly nymph trailed by a small mayfly when fishing under an indicator. Choose dark, drab patterns that mimic a Blue Winged Olive nymph. Stoneflys are effective in a wide range of colors so don’t be afraid to experiment. Egg flies can be effective as well, especially late in the season when some fish have already moved onto the redds and there are natural eggs in the system. Soft hackle flies, such as a soft hackle Pheasant Tail or soft hackle Hare’s Ear are also good bets and can be fished on a dead drift of swing. For streamers, I like large articulated patterns if I am going to be stripping them out of the boat. If I am going to swing streamers, I’ll choose a string leech or intruder style of fly. Regardless of the technique chosen, the key to catching these migratory trout is identifying where they will be holding in the river. Since these fish are used to living in a lake environment, the slowest, deepest runs you can find will be a good place to start. These deep, slow buckets are an ideal place to nymph fish, especially at the heads of the run where the water begins to slow and deepen. The most important thing in nymph fishing is getting your flies down in front of the fish. If you are not bumping the bottom and getting snagged up occasionally, you are not fishing deep enough. You will want to find a comfortable balance between leader length and the amount of weight you are fishing. I typically use a 10ft leader when nymphing in the fall, whereas in the summer my nymphing leaders are only about 8ft. Swinging steamers is most effective in shallower runs or at the tails of pools, where the water picks up some speed and isn’t quite so deep. Steelhead fisherman will tell you that they look for water about the same speed as your average walking pace when they are looking to swing flies. If you are going to strip streamers out of a boat, concentrate on structure along the bank as well as ledges where the water transitions from shallow to deep. The Yellowstone Park section of the Madison is the most popular area for fishing the fall run because it gets the highest number of fish that move into the river. Both Browns and Rainbows begin to push out of Hebgen Lake in late September and will be in the river until the YNP season closes on the first Sunday in November. Yellowstone Park does not allow float fishing, so this is strictly a wade fishery. Both nymphing under an indicator and streamers are popular and effective techniques here. The fall run is about evenly split between Browns and Rainbows, with the average fish going between 16” and 20”, with a fair number up to 22”. 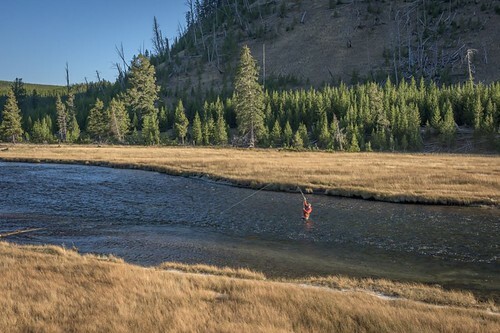 The Madison in Yellowstone Park is a broad, shallow river so the most challenging aspect of this fishery is locating the runs that hold fish, which sometimes can be miles apart. The most popular area, by far, is a group of deep runs located just inside the Park boundary known as the Barnes Pools. This area is reached via a dirt road that is located just inside the parks west entrance at West Yellowstone, MT. The dirt track splits before reaching the river, providing access to the upper and lower pools. Immediately upstream is another nice area, known as Cable Car Run, followed by miles of shallow, unproductive water. The river begins to deepen again towards its headwaters at Madison Junction, and you can spot productive runs from the car as the road closely parallels the river here. There are some sneaky spots here and there that hold fish, and that is the reward for the adventurous angler who takes the time to learn the fishery. In local angling parlance, “Between the Lakes” refers to the short section of the Madison River between Hebgen Dam and the head of Quake Lake. Quake was formed in August of 1959 when a huge earthquake triggered a massive landslide that blocked the Madison River, killing 28 people in the process. Dead trees break the surface to this day, an eerie reminder of the power of nature. Though it’s barely two miles long, this stretch holds an extraordinary number of fish due to the fertile tailwater environment and close proximity to the lake. However, the population is greatly skewed towards Rainbow Trout, so this section sees the fewest number of fall run Browns. Though much fewer in number, this section holds the biggest Browns in the river. In the spring of 2013, a dead Brown that measured 38” and weighed 35lbs was found in the area and several fish over 30” have been caught in the last few years. While your odds of catching a fish this size are astronomically low, it is a good feeling knowing you are fishing water with such potential. Realistically, you can expect good numbers of Rainbows in the 14”-17” class, with Browns up to 22”. Between the Lakes is a swift, boulder strewn run that is best suited to nymph fishing. In addition to the flies discussed above, classic tailwater patterns like a Ray Charles or Scud are worth a try in this section. While this water doesn’t look anything like the Missouri or Bighorn, the same types of fly patterns will work. The key water type to look for here is the slack water on the backsides of current obstructions such as rocks or islands. While there are a few nice deep holes, don’t get stuck on the depth of the water too much. It such a swift section of river, finding water that is the right speed becomes paramount, even though migratory fish typically gravitate towards slower, deeper water. This entire section of river is basically roadside, so it is quite easy to scope out and pick a good spot. This section of river is open year round, so it is a good option in November after Yellowstone Park closes. The run here starts a bit later than the other two sections as well. If you are interested in fishing out of a drift boat, then the section of river from Varney Bridge down to the town of Ennis is where you want to be. From town down to Ennis Lake, the river is restricted to wade fishing only. Access here is tough as the river is in a bit of a willow jungle, so the preferred strategy is to use a boat to move from hole to hole, which is allowed as long as you exit the boat before you start fishing. Fish will start pushing into this section in mid-late September, and by mid-October will be dispersed throughout the river quite a ways upstream. The number of fish here is somewhere between Yellowstone Park (the most) and Between the Lakes (the least). Pressure is less here as well, given the necessity of a boat to reach much of the fishing. When float fishing from Varney to Ennis, I prefer to strip large streamers with a sinking line. The river twists and turns through the willows here at a pretty good clip, so the rapid fire nature of streamer fishing suits it quite nicely. You can certainly nymph fish here, but even so I like to choose a small streamer as my point fly even though I will be dead drifting it under the indicator. The fast current will impart action on the fly and it makes having a perfect dead drift less important. The river braids quite extensively here, so a skilled oarsmen with local knowledge is important, as some channels contain logjams, dams, and other obstructions. I like to nymph fish down below Ennis, as again this section is restricted to wade fishing only. This section, known locally as “The Channels”, has even more islands and side channels than the Varney to Ennis stretch. The river is typically shallow here, with the deep runs getting most of the attention. There are plenty of sneaky spots to be found. As such, it takes a long time to learn this section well. Another interesting aspect of floating The Channels is that the boat ramp you use to take out is actually on Ennis Lake, requiring you to row almost a mile across the lake. It’s wise to check a wind forecast before committing. If you want to wade fish, the best access is the Valley Garden Fishing Access Site, which is just downstream from town. It’s kind of a jungle in there, but you can hike both upstream and down. Brian McGeehan is a Pennsylvania native and has been guiding Western rivers in Montana, Wyoming and Colorado for 20 seasons. He is a licensed Montana outfitter and owner of Montana Angler Fly Fishing based in Bozeman, MT. I often see a common question come up early in the learning curve for anglers looking to get into small stream, wild trout angling: How do I find good streams to fish? It can be an intimidating first hurdle to overcome, but once over it, the way is open to a very rewarding angling experience. It requires some homework, often good for a cold evening in the dead of winter with your beverage of choice. You’ll swing and miss sometimes, but the home runs you hit will be well worth the strikeouts. 1. Locate via some simple Googling, the following three lists published, and regularly updated by the PFBC: 1) Natural Reproduction List. 2) Class A Wild Trout List. 3) Wilderness Trout Streams List. They contain different information, and there is some overlap between them, but it is all useful. They all indicate the county the stream is in, so you can use that to begin to narrow things down. 2. (Optional, but not necessary. Good for a beginner with this method, but the more successful you get, you’ll find you’ll rely on these less.) Purchase a couple of PA stream guide books. Dwight Landis’ is very good, and is my personal favorite, but there’s several other good options out there as well. Again, some simple Googling will head you in the right direction if you wish to purchase these. They all run about $20-$30. 3. Review the above-mentioned lists and books and locate some streams in a given area that you think interest you. Cross reference those stream’s locations with a good mapping software. Google Maps works very well for this, and of course, is free. Are the streams on publicly owned land? If not, who owns the land? What are the potential access points? Of course, it goes without saying, always be respectful of private and posted land. Toggle between topographic and satellite views. Is the stream in a remote forested area, or is it running through folks’ back yards? How big does the stream look? How steep/rough does the terrain look? State and National Forest maps are available online for more information. Kudos as well to the Pa. Game Commission as they have recently updated and published detailed maps online of every single State Game Lands tract in PA. They’re very useful for helping confirm access and parking locations for streams on SGL. 4. After your research in Steps 1-3, pick three or four potential streams in an area and head out for a day to check them out. This way you have a couple back up plans if you get to a stream and find unforeseen access problems, or another angler already there. Or if a stream just turns out to be a dud, which happens sometimes. 5. Once you’ve fished a few of these streams and located a couple good ones, start to think about what they have in common. Take note of what you saw on the maps, and what the stream turned out to actually look like when you got there. Was it what you expected? How big was it? What was its gradient? Did it have lots plunge pools, or was it more riffles and runs? What kind of water fished best? Then look for those similar characteristics in other areas using the lists, books, and maps. You’ll find you’ll quickly become pretty good at it. Before long, you’ll start working backwards – looking at the maps first for good potential spots based on what you’ve learned, then cross referencing with the lists and books….This is when you know you’ve figured it out. As long as you’re willing to make a bit of a drive sometimes, do a bit of homework first, and be willing to strike out once in a while, this will work, if you try it. We are very fortunate to live in a state with the amount of small, forested wild trout water Pennsylvania has. Get out there and enjoy it! Fall fly fishing in the the region offers plenty of great opportunities. The cooler weather offers anglers some solitude of fly fishing while many are caught up with other fall activities. A little bit of preparation can be a rewarding opportunity for those who can make the time. Reproduction plays an important part of the trout lifecycle during the fall months for both brook and brown trout. Brook trout, native to the US, usually begin to spawn during late September through October. 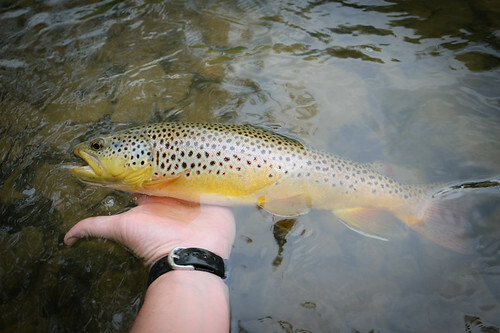 Brown trout typically start spawning in October through late November. I have seen this go later too. During the spawn coloring on the trout will intensify especially in the males. Females will often create gravel beds for the fertilized eggs called redds. It very important to be careful of these sections on streams when you see redds and not to kick them up when walking. Probably best even to leave trout overtop redds alone and give them a chance to protect the eggs. Often the water in the fall is low and gin clear. Spotting trout on a redd is pretty easy to see as in the photo to the left. The trout will sit over top of a small group of rocks that they have knocked around and they often will have a little more cleaned up look as if someone kicked up the spot. Take a little time before marching into the stream to check on the conditions. Good advice for any day. As the trout begin to change so does the entomology or insect life in the stream. Activity will be different from region to region, stream size, earlier summer water temperatures, and geology. The fall provides a more limited selection of insects and often anglers enjoy bringing a more modest selection of flies and imitations. Some of the more popular collections include: Slate Drakes, BWO, Caddis, midges and terrestrials. Typical nymphs and streamers are very successful smart choice as well. I like Dave Weavers suggestions for even looking for rainbows behind the redds feeding on eggs. Some small simple egg patterns can produce some pretty good results for these rainbows. The most common color for natural trout eggs are cream, pale orange and pink. The full and fast spring streams can take a new characteristic once September arrives. Low clear water can create a challenge for some anglers, but stealth and patience can provide many rewards. With summer holder over trout and newly stocked trout in many streams there should be ample opportunity for solitude and fish in autumn. Check out the PaFlyFish forums and stream reports to learn more about what is happening in your area.